More then 57 years ago, Hunt Hill’s original landowner, Frances Andrews, asked that the National Audubon directors continue to encourage international participation, because of her family’s interest in both international affairs and environmental conservation. Current directors continue to honor Frances’ wish by hosting two immersion camps annually, marrying together language skills and cultural knowledge into an intensive one-week session targeted at adults. 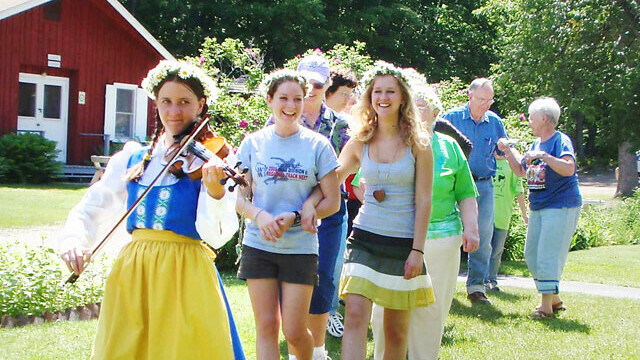 Native language speakers are at the helm of each program – På svenska: Adult Swedish Language and Culture camp, June 12 -17, as well as Hunt Hill’s Spanish version, August 14-19. Whether you’re a true beginner or looking to brush up from your high school language skills, Hunt Hill welcomes all proficiency levels. Each program not only teaches foreign language lessons, but also touts lessons in culture, politics, history, religion, and, of course, cuisine. Camp costs are all inclusive for the week, including food, shared room lodging, and program supplies. Both camps are located on the beautiful Hunt Hill property – 400 acres of glacial lakes, tamarack bogs, prairies, and forests. Campers will have the opportunity to partake in guided hikes and explore the lakes via canoe or pontoon in true summer camp style. Applications are on a first-come, first-served basis and space is limited.